Liriope muscari growing leaf plant of the genus Liriope also known as Lily turf or Big blue lilyturf, Liriope muscari perennial evergreen plant, used as ornamental plant and can be used as groundcover, can grow in temperate, subtropical, mediterranean climate and growing in hardiness zone 6-10. Leaves color green can be variegate white or yellow in linear shape. Flower color purple, pink or white in star shape grows on raceme. 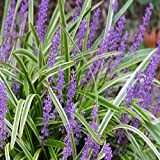 (18 Count Flat-3.5" Pots) Liriope Muscari 'Big Blue' Monkey Grass/lilyturf (Groundcover) the Most Well Known Variety of Liriope, Deep Green Foliage, Lilac Flower Spikes, Moderate Spreader.